This is a review that’s probably going to annoy some people, because it’s of basketball drama High Flying Bird and it’s written by someone who has absolutely no idea about the world of sports. I’m not exaggerating when I say that my knowledge for sports of all kinds, from football to rugby to basketball and so on, is so miniscule that you’ll need to don the Ant-Man suit and shrink all the way down to the Quantum Realm just to find only one thing I know about it. I know so little about sports and especially the business side of things that it’s honestly really difficult for me to make sense of what the characters are talking about, or even what’s going on in the actual plot. It’s the exact same problem I had with Moneyball from a few years ago; like High Flying Bird, it’s objectively a good movie, but the script was filled with so much sporting industry jargon and complex business conversations that I found it extremely tough to understand. So, needless to say, I am perhaps the worst person to be talking about this kind of film, but since I need content for this website, and I don’t have any other writers at my disposal, you’re stuck with my confused-as-hell thoughts on this film, but I promise that I will do the best that I can to try and talk about why this movie is at the very least objectively good. Directed by Steven Soderbergh in his first feature with distributor Netflix, we learn that an NBA “lockout” has brought the world of basketball to an effective halt, and players are beginning to grow frustrated by their lack of progress, especially the newer players who were signed on just before it began twenty-five weeks ago. Articulate and savvy sports agent Ray Burke (André Holland) is our main focus, though, as he wanders throughout New York and even beyond over a period of 72 hours to try and bring the stalemate to a merciful end, with the reluctant help and support of his on-and-off-again assistant Sam (Zazie Beetz) and his young VIP client Erick (Melvin Gregg), as well as the guidance of his mentor, veteran sports coach Spence (Bill Duke). It’s no coincidence that I mentioned Moneyball earlier, because funnily enough Soderbergh was originally set to direct the film until creative differences saw him replaced with eventual director Bennett Miller; if Soderbergh had indeed gone on to direct the Brad Pitt movie, it probably would have felt as immediate and straightforward as High Flying Bird is. Regardless of how much you know about the sporting business, the film is a fascinating film to watch if only for its tight and precise script – by Tarell Alvin McCraney, who wrote the play that inspired Barry Jenkins’ Moonlight – and Soderbergh’s proficient and technologically intriguing filmmaking; like his previous feature Unsane, he shot the vast majority of it on an iPhone, and given how crisp and professional the overall image quality looks here you honestly wouldn’t be able to tell half the time. The acting is also top notch, with Holland giving a very confident portrayal of a man always on his feet, and strong support from Beetz and Duke as two particular stand-outs who both bring some weight to their parts. There’s no denying that by most accounts, this is a rather good movie; but for me personally, it was still a struggle to get through only because I was seriously having a hard time trying to figure out what on earth these people were talking about. I know absolutely nothing about contract negotiations, business meetings or anything that links directly to the business side of sports, and the film relies significantly on the viewer already having a basic knowledge of this stuff for them to get the most enjoyment out of it. With something like The Big Short, I also know nothing about the housing market and the rest of the financial world, but the movie knew that most of its audience wasn’t quite as in tune with all of that so it tried explaining it to us in ways that made it very simple to understand; here, it’s difficult for anyone who doesn’t understand a single thing about this kind of business to watch without getting confused about all these sayings they’re throwing at you, as you’re continuously lost even when you’re intrigued by how it’s all going to end up. Again, though, this is just a reflection of my own experience with the film, and what I feel about the film is most likely not going to be the same for another person; I do agree with most people when they say that this is a fascinating movie, but I just felt so far behind when they’re going on and on and on about all this stuff that I really don’t understand. There is a lot of other interesting stuff to this movie as well; comparisons to slavery and the treatment of black basketball players throughout the sport’s history are brought up a lot, to a point to where Bill Duke’s character makes anyone who unwittingly brings up slavery in their conversation about basketball recite a phrase: “I love the Lord and all His black people.” Spliced throughout the film are interviews with real-life basketball players, who mention at several stages how difficult being in such a tight position can be, while the rich and mostly-white people at the top of the chain are more focused on their upcoming holidays to Australia than listening to the needs of the players they’ve recruited. Clearly, there are a lot of ideas at play in this film, in both Soderbergh’s direction and McCraney’s script, and for a film that was shot largely on a smartphone it’s incredibly ambitious stuff that makes me wish I understood more about this sort of stuff to really appreciate even more. 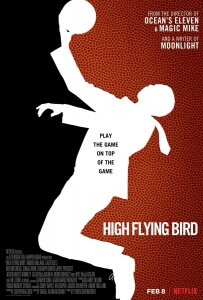 High Flying Bird is an intriguing and ambitious project from director Steven Soderbergh and writer Tarell Alvin McCraney, while it is objectively good with strong performances and fascinating technical prowess, it may prove difficult to follow for anyone who has no idea how the sporting business works.